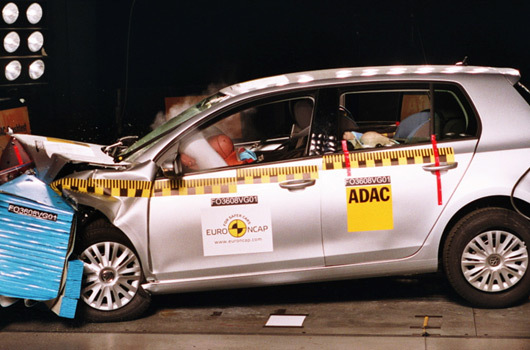 The new Volkswagen Golf VI has been awarded a maximum five-star rating by the Euro NCAP (European New Car Assessment Programme) crash test agency. The new Golf’s result matches the star rating achieved by the current Golf V. However, the new Golf has received 36 out of a possible 37 points for occupant protection leading to its five-star award. In the area of pedestrian safety, the new Golf scored an impressive 3 stars. The new Golf will be among the safest vehicles currently on sale, thanks to the fitment of seven airbags, including a knee airbag, as standard across the range. This is in addition to standard Electronic Stabilisation Programme (ESP), Brake Assist, ABS, the introduction of new whiplash reducing headrests, side impact protection and a stronger chassis structure than ever before. Furthermore, a new sensor concept for crash detection has been introduced with the Golf. The development of this so-called “crash impact sound sensing” system was awarded the innovation prize in Bavaria in May 2008. Volkswagen has always been at the forefront of occupant safety. The Volkswagen 411, launched in 1968 featured front crumple zones and a passenger survival cell, a trait carried over to the Mk I Golf in 1974 while adding self-stabilising steering, rear crumple zones and fuel tank protection. In 1987 the Golf II was fitted with ABS for the first time and in 1991 the Golf III introduced a collapsible steering column, side impact protection and traction control. The 2004, the Golf V achieves a five-star Euro NCAP rating. A total of 34 years and 26 million sales after the introduction of the Mk I Golf, the Golf VI continues to set new standards.